One of the easiest ways to turn your house into a home is to bring in the outdoors by adding green plants. A simple green plant brings beauty, character, depth, and nature into your space. I don’t necessarily have the greenest of thumbs, but I do find that having real flowers and plants in my home allows me an escape from the day by forcing me to tend to my little wonders. I love watching the progress of how they grow and take full shape. Hang plants like pieces of art. I LOVE this idea. It’s simple yet clever. Just grab some frames or shadow boxes large enough to add in some plants; then, make sure you select a plant that hangs and doesn’t grow vertically, unless you get a box that can accommodate that shape. Upside down hanging plants. TOO fun. You need to select the right plants to achieve this look; but once it’s done, it’s a fun conversation piece for your home. Beautiful ceramic planters. 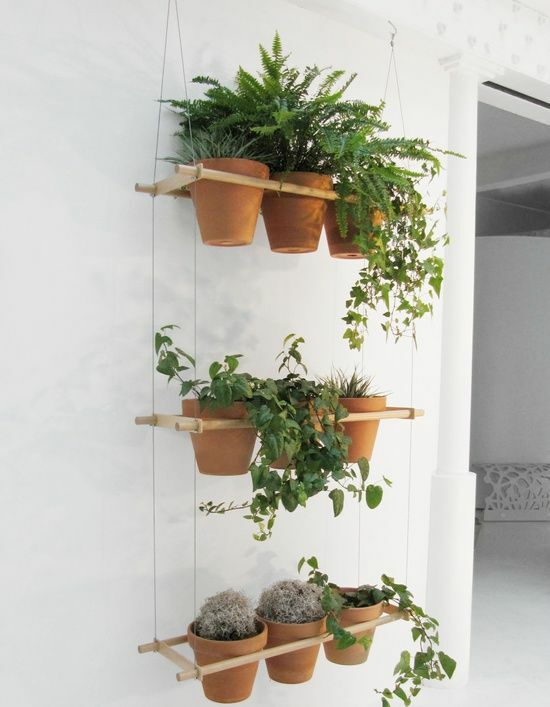 These simple yet beautiful ceramic planters hang on the wall. Pair them in groups to create a fuller look. Plant pods. This look is successful because the pods are hung en masse to create a whimsical and unexpected look. Hanging ladder. This look is achieved by using a simple wooden slate with holes punched through for a snugly fit pot. It also acts as a room divider. 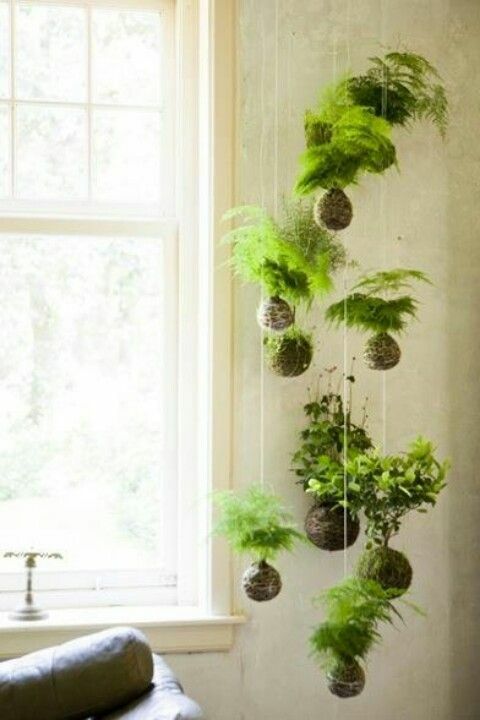 Hanging plant balls. I think this look is so elegant. Three simple yet substantial plants hung in the corner of a room is a great focal point for a space. One long hanging plant. 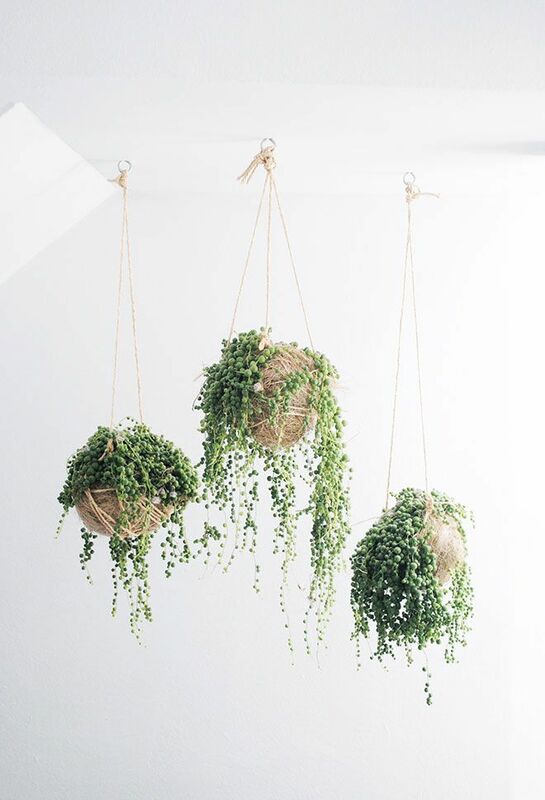 Hung high from the ceiling, this ceiling plant is able to display all of its beauty by creating a sweeping look. Macrame hangings. Mini-sized macramé plants hang from a column taking the architectural feature from boring to interesting. Wall hanging. This plant hanging, hung against the wall, acts as an art piece. Ceramic holders. Here the star of the show isn’t just the greenery, it’s the ceramic piece itself. Clump the pieces in bunches for a beautiful variety. Mini ceramic window hangings. These little green dudes are the perfect size to allow the light to still come in. Plants over a desk. This is perhaps my favorite look of the bunch. The greenery fits so well into the green-colored space. The plants are hung high enough so that the view at the table is not blocked. Do you have hanging plants? What are you tips for taking care of them? The names of the kind of plants used were absent from this article. The whole point for me was; what plant is that? I’m looking for knowledge to create the entire image, not just the structure of.